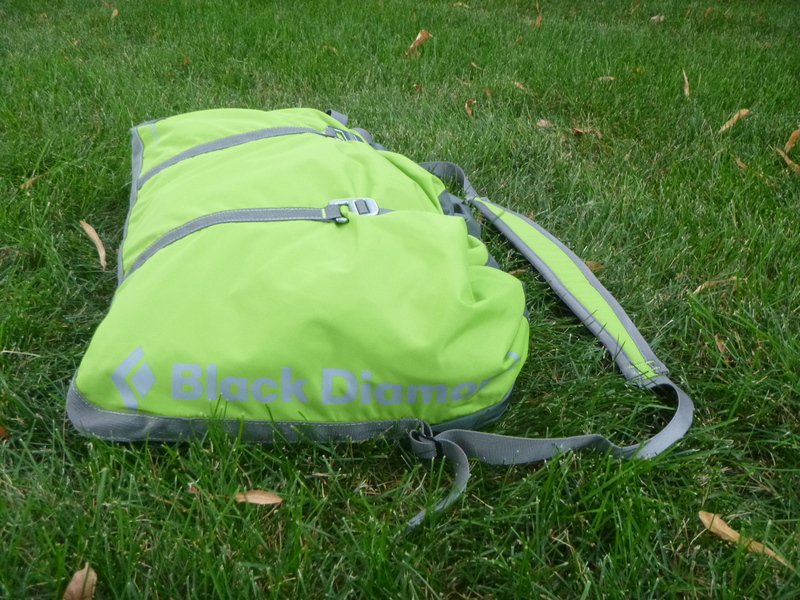 The Black Diamond Super Chute rope bag is a durable, easy to use rope bag that is large enough to carry an 80 meter climbing rope. 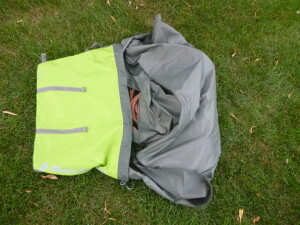 I’ve been using this bag for a couple of years and it has performed perfectly with almost no wear despite plenty of use. 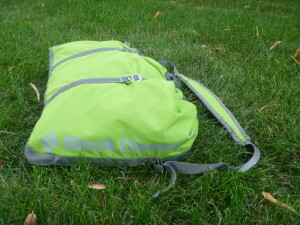 This review of the Black Diamond Super Chute will give you the good, the bad and the ugly on this bag. The Black Diamond Super Chute loaded with a Mammut 60 meter rope. 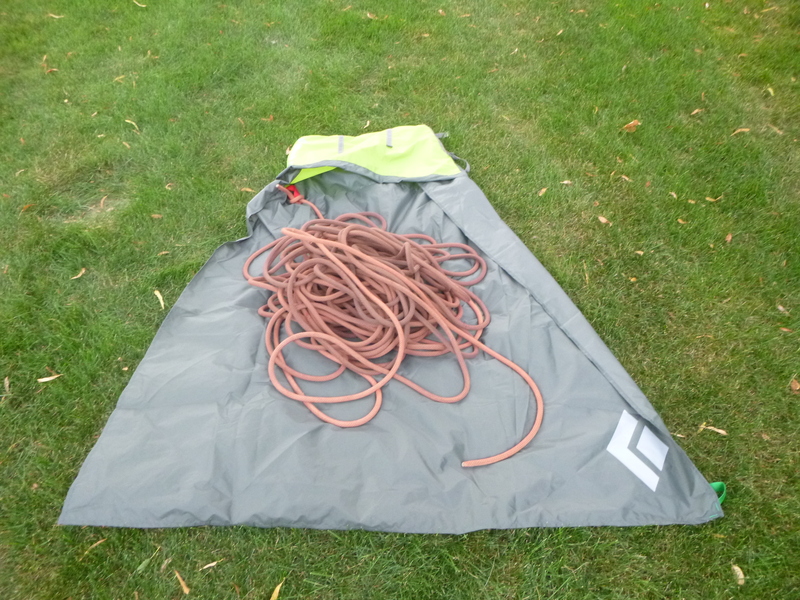 The super chute starts with a 57 by 49 inch tarp and gives it a slight funnel shape for easy loading. 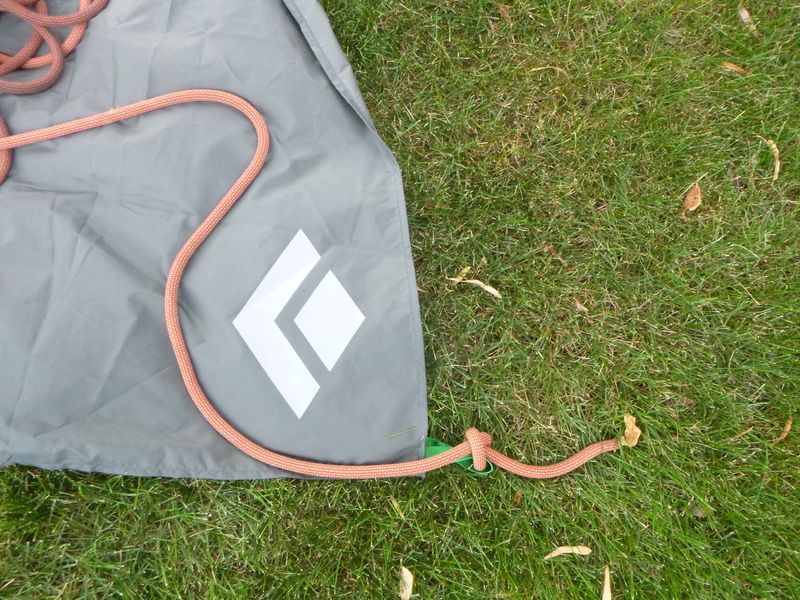 The funnel shape doesn’t get in the way of flaking out the rope or belaying. Check out the pic below to see what I’m talking about. To the tarp they add a 25 liter (1,525 cubic inch) bag made out of durable 400d nylon. The Super Chute with a fatty 60m Mammut rope. Note the funnel shape. The bag is carried by a padded messenger bag style strap. It’s good enough to hike a couple of miles but I wouldn’t go further than that with it. The bag includes both a drawcord and compression straps so that the rope can be completely secured. 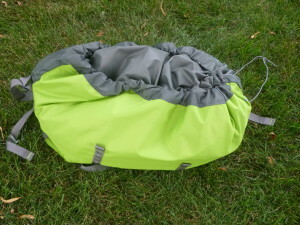 The bag has two loops sewn into it, one red, one green. Tying the rope into these loops serves two purposes. The first is that when you throw the bag the rope stays firmly in the bag and releases properly. The other is so that the ends of the rope are managed properly, with the red end being the belayer’s end that stays tied to the bag and the green end being the climbers end that is untied so that the climber can tie in. If the belayer’s end of the rope is tied into the bag it can’t accidentally pass through the belay device resulting a fall. Here’s the green tie in loop. 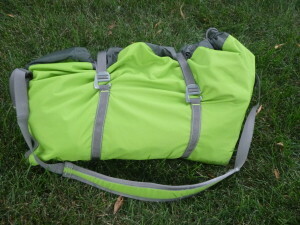 I’ve got the lime green version of the bag. It also comes in blue, black, and red. A couple of times I’ve put my shoes, chalk, and draws into this bag to go sport climbing for just an hour or two. If you don’t have much to carry this is a convenient way to get everything you need back to the crag. 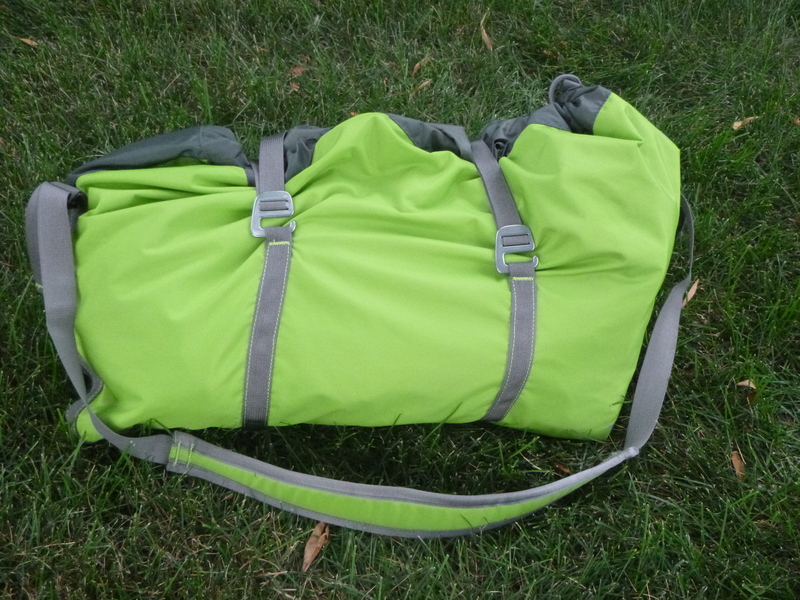 This is one of the largest rope bags out there so if you think you might want to carry an 80 meter or a shorter rope and some gear this is a good choice. 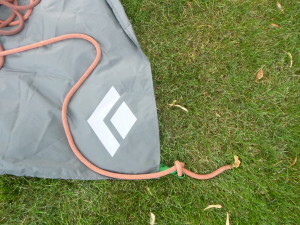 This should be self-explanatory but to use the Super Chute rope bag you first flake out the rope onto the tarp. Then tie both ends of the rope into the loops. Roll the tarp and rope into the bag like a giant nylon burrito. Super chute with the drawcord tightened. Finally connect and tighten the compression straps.